Despite its small size, this compact rescue knife packs serious punch in a pinch. 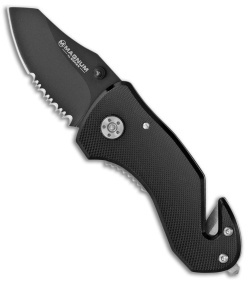 It features a black coated, stainless steel blade with a partially serrated edge for cutting rope and other cord. Built into the black aluminum handle is a handy seatbelt cutter and glass breaker for emergency situations. Includes a pocket clip for everyday carry.